February 6th and 7th ETB 1020. 7:30-8:30 PM. Once you've completed the Learn to Sail class and paid your dues, you'll get you can start qualifying to skipper our various sailing craft during club sailing times each week. Come join AYC for our official first sail of the semester! The focus of this event is to introduce our new members to sailing and the AYC lifestyle with a focus on introducing new members to more experienced returning members. A full day of casual, relaxing sailing with food, drinks and games while you hang out on the shore. Join us one day or both days! We will be having first sail at Lake Conroe this semester. Food will be provided. More details about time will be provided as we get closer to the event on the AYC facebook page. Join AYC for our bi-annual Lake Conroe camping trip. We will be traveling down to Lake Conroe the evening of the 3rd, eating and camping that night. In the morning, we will make breakfast and then get on the water for an day full of amazing lake sailing. We will break for lunch, sail some more and eat dinner and return to College Station that evening. Conroe's facilities include indoor plumbing, space for hammocks and lots of great views of Lake Conroe. ​Non-members are welcome for a small fee as well. 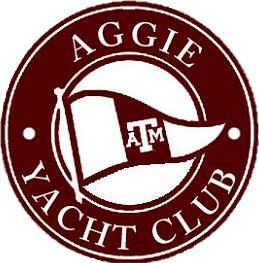 Join the Aggie Yacht Club as we participate in Texas A&M's Big Event! This is a great opportunity to give back to the BCS community while also getting to spend time with members of the club. ​Sign up information coming soon.